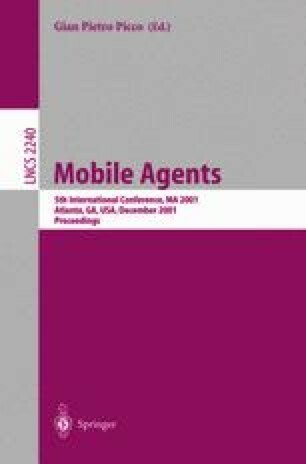 This paper presents a mobile-agent framework for building and testing mobile computing applications. When a portable computing device is moved into and attached to a new network, the proper functioning of an application running on the device often depends on the resources and services provided locally in the current network. To solve this problem, this framework provides an applicationlevel emulator of portable computing devices. Since the emulator is constructed as a mobile agent, it can carry target applications across networks on behalf of a device, and it allows the applications to connect to local servers in its current network in the same way as if they were moved with and executed on the device itself. This paper also demonstrates the utility of this framework by describing the development of typical location-dependent applications in mobile computing settings. International Business Machines Corporation, “Remote Abstract Window Toolkit for Java”, http://www.alphaworks.ibm.com/, 1998.